Each 12 stitch repeat of the main stitch uses only one YO and one k2tog, so suitable for a beginner lace knitter. Only four different rounds are needed to build up the little lace sections, which to me look like little wings. Gauge is not critical as long as you like the density/drape of the fabric. 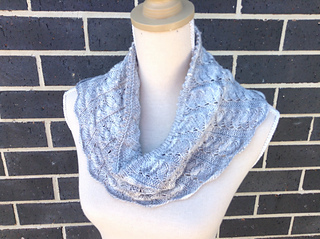 Size can be adjusted by casting on more or fewer repeats of 12 stitches.